Paul Fürst, engraving, c. 1721, of a plague doctor of Marseilles (introduced as 'Dr Beaky of Rome'). His nose-case is filled with herbal material to keep off the plague. The clothing worn by plague doctors was intended to protect them from airborne diseases. The costume, used in France and Italy in the 17th century, consisted of an ankle length overcoat and a bird-like beak mask, often filled with sweet or strong smelling substances (commonly lavender), along with gloves, boots, a wide-brimmed hat, and an outer over-clothing garment. Plague doctor outfit from Germany (17th century). The mask had glass openings in the eyes and a curved beak shaped like that of a bird with straps that held the beak in front of the doctor's nose. The mask had two small nose holes and was a type of respirator which contained aromatic items. The beak could hold dried flowers (including roses and carnations), herbs (including mint), spices, camphor, or a vinegar sponge. The purpose of the mask was to keep away bad smells, known as miasma, which were thought to be the principal cause of the disease, before it was disproved by germ theory. Doctors believed the herbs would counter the "evil" smells of the plague and prevent them from becoming infected. 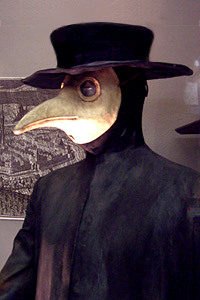 The beak doctor costume worn by plague doctors had a wide-brimmed leather hat to indicate their profession. They used wooden canes in order to point out areas needing attention and to examine patients without touching them. The canes were also used to keep people away, to remove clothing from plague victims without having to touch them, and to take a patient's pulse. Medical historians have attributed the invention of the "beak doctor" costume to Charles de Lorme, who adopted in 1619 the idea of a full head-to-toe protective garment, modeled after a soldier's armor. This consisted of a bird-like mask with spectacles, and a long leather (Moroccan or Levantine) or waxed-canvas gown which went from the neck to the ankle. The over-clothing garment, as well as leggings, gloves, boots, and a hat, were made of waxed leather. The garment was impregnated with similar fragrant items as the beak mask. Lorme wrote that the mask had a "nose half a foot long, shaped like a beak, filled with perfume with only two holes, one on each side near the nostrils, but that can suffice to breathe and to carry along with the air one breathes the impression of the drugs enclosed further along in the beak". 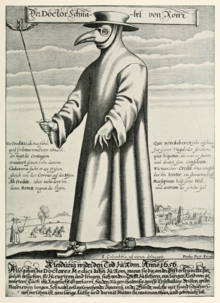 The Genevese physician Jean-Jacques Manget, in his 1721 work Treatise on the Plague written just after the Great Plague of Marseille, describes the costume worn by plague doctors at Nijmegen in 1636–1637. The costume forms the frontispiece of Manget's 1721 work. The plague doctors of Nijmegen also wore beaked masks. Their robes, leggings, hats, and gloves were made of morocco leather. This costume was also worn by plague doctors during the Plague of 1656, which killed 145,000 people in Rome and 300,000 in Naples. The costume terrified people because if one saw it, it was a sign of imminent death. Plague doctors wore these protective costumes in accordance with their agreements when they attended their plague patients. The costume is also associated with a commedia dell'arte character called Il Medico della Peste (the Plague Doctor), who wears a distinctive plague doctor's mask. The Venetian mask was normally white, consisting of a hollow beak and round eye-holes covered with clear glass, and is one of the distinctive masks worn during the Carnival of Venice. ^ Füssli's image is reproduced and discussed in Robert Fletcher, A tragedy of the Great Plague of Milan in 1630 (Baltimore: The Lord Baltimore Press, 1898), p. 16–17. ^ Doktor Schnabel von Rom, engraving by Paul Fürst (after J Columbina), Rome 1656. ^ a b Vidal, Pierre; Tibayrenc, Myrtille; Gonzalez, Jean-Paul (2007). "Chapter 40: Infectious disease and arts". In Tibayrenc, Michel (ed.). Encyclopedia of Infectious Diseases: Modern Methodologies. John Wiley & Sons. p. 680. ISBN 9780470114193. ^ Iqbal Akhtar Khan (May 2004). "Plague: the dreadful visitation occupying the human mind for centuries". Transactions of the Royal Society of Tropical Medicine and Hygiene. 98 (5): 270–277. doi:10.1016/S0035-9203(03)00059-2. PMID 15109549. Charles Delorme (1584—1678), personal physician to King Louis XIII, was credited with introducing special protective clothing for plague doctors during the epidemic in Marseilles. It consisted of a beak-like mask supplied with aromatic substance, presumed to act as filter against the odour emanating from the patients, and a loose gown covering the normal clothing. On occasions, a drifting fragrance such as camphor was used.